Over this past week, our DT correspondent Brian Tran (W'10) has talked about how he got into screenings without too much begging, how tears welled up in everyone's 3D-glasses-covered-eyes, and the hot and not-so-hot movies of Cannes. In today's post, Brian sums up his Cannes experience, reveals something that made him squirm and scream, and reveals how begging got him the hottest ticket in town! Every year at Cannes, there is a film that raises the ire of cinephiles and critics alike, prompting outcry and controversy. Last year, we had the divisive Serbis, directed by Brilliante Mendoza. This time, crazy/brilliant auteur Lars Von Trier (Dancer in the Dark, Dogville) brought the goods and thrilled audiences with his aptly titled Antichrist. Known as the film that got Von Trier out of his clinical depression, Antichrist was probably the hottest non-Hollywood ticket at Cannes. Although I certainly had perks with my festival badge, I was not able to net an invitation using the online invitation system meaning I had to resort to alternative means. Once again, I pulled out my blank sheet of paper and my Sharpie and drafted up a quick sign asking for an extra “Antichrist” ticket. As I staked out my old begging corner from last year, I realized how odd it must have seemed to see a student in a tuxedo holding a sign that read ANTICHRIST on the streets of Cannes. Fortunately, it was my lucky day and I was given a fantastic orchestra ticket within fifteen minutes. Inside the Grand Lumiere Theater, I was thrilled to discover I was sitting in the same row as the filmmakers and actors, just on the aisle. Willem Dafoe, Charlotte Gainsborough, and Lars Von Trier were seated only feet away from me during the film. Mick Jagger was mingling with his guests in the row in front of me (see picture below). During this intense psychological horror film, an unnamed couple (Dafoe, Gainsborough) deals with the grief of losing their only child. There were several scenes that drew visceral reactions from the audience, causing me to squirm and scream. The filmmakers of Hostel and Saw could learn a few lessons from Von Trier in terms of torture and pain. After a particularly horrific moment when I jumped and shrieked aloud, I hear faint laughter coming from my left. I turn my head to discover Lars Von Trier himself watching me curiously and giggling at my expense. Probably not a film I would ever see again, I would recommend Antichrist to fans of Von Trier’s previous work and those who wish to subject themselves to psychological and emotional scarring. The film is gorgeous and well made, but I definitely recommend with caution. On another note, I do wholeheartedly recommend this year’s Palme d’Or winner, Michael Haneke’s The White Ribbon, a subtle, yet riveting look at the everyday lives of a small Protestant German village on the eve of World War I. The austere black and white cinematography matches the reserved emotional oppression found in the faces of each child that would eventually grow up to become a Fascist. Definitely a slow burn film in which events gradually build over a two-hour plus length, The White Ribbon takes its time revealing its cards but every moment is used exquisitely and no frame is expendable. 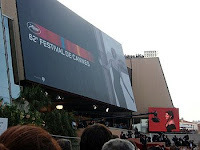 The 2009 Cannes Film Festival certainly had its highs and lows, but it was a completely different experience this year compared to last. I had a different agenda that did not require me to watch films wall to wall and I was able to access areas of the Festival that were not available to me previously. At last year’s Festival, I met my close friend and collaborator Courtney Terwilliger (C'10) who involved me in the making of her latest short, “The Power of Freedom.” Our film was entered into the Short Film Corner and the Film Market of the Festival, allowing me a unique insight into the innards of the Festival. Although the glamorous competition films attract the most attention from the media, the Market was definitely the iceberg beneath the red carpet waters. 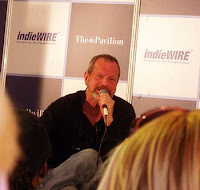 I watched independent filmmakers clamor to arrange meetings with buyers and potential backers to fund future projects. There is so much involved with getting a film made that goes unseen by audience eyes. Perhaps one of the ambitious directors I met in passing could become the next Palme d’Or auteur. 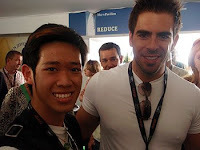 Cannes has given me the motivation to continue on my path toward a career in entertainment. Before coming to France last year, filmmaking seemed a distant dream, one that was almost impossible to achieve. Now, after meeting with Penn alums such as CAA head Rick Hess (C'84) and Geoffrey Gilmore (C'74) who have made fantastic careers in this industry, I have renewed aspirations and high hopes for the future. This summer, I’m interning at International Creative Management (ICM), an option I discovered last year when our class met with ICM CEO Jeffrey Berg, a Penn parent. Although I’m far from a Cannes veteran, I learned a thing or two about film festivals and the entertainment industry in general. Hopefully, I will be visiting the beaches of the French Riviera for many years to come. P.S. While you’re catching glimpses of Penn in this summer’s Transformers 2 (see photos from shooting on Penn's campus HERE, keep an eye out for me too! I’m an extra in the college scenes, so look out for my big screen debut! Check back soon for actual advice given this year from Penn alumni Rick Hess (C'84), Geoffrey Gilmore (C'74) and Penn parent Jeff Berg! "The opening night film of the 62nd Cannes Film Festival was Disney-Pixar’s 3D film, “Up.” First, it was hilarious to see all 2,300 film-goers, dressed in their Armani tuxes and Dior gowns, donning heavy unwieldy 3D glasses. I don’t know if these will be the glasses used in theaters across America when the film is released on May 29th, but these glasses were definitely at the forefront of 3D technology. They had thick polarized lenses that were actually light sensitive based on a little black area in between the eyes. When the theater got dark, the glasses would switch on and the lenses would turn blue, then green, then clear. Very cool. The film itself was an absolute delight, capitalizing on all of Pixar’s many strengths to create a smooth, quickly paced, emotional journey that never failed to amaze. “Up” tells the story of Carl, a cantankerous old man, who when evicted from his long time home, decides to take matters into his own hands. He attaches tens of thousands of helium balloons to his house and takes flight to South America, meeting fascinating and hilarious characters along the way. Definitely the funniest Pixar film yet, “Up” is still grounded in very real emotions and the filmmakers never shy away from putting their characters in real danger. The first ten minutes of the film are pure brilliance, using a montage to tell the story of Carl and his wife. It showcases how they first met, through their happy marriage, their struggles with childbearing and ending with her death. Like Wall-E, this montage doesn’t use a single word of dialogue, yet by the end, many audience members were wiping tears out from under their heavy 3D glasses. The 3D itself was a showstopper, with the audience breaking into applause the second Cinderella’s castle appeared in the opening credits and the fireworks explode out into the audience. It’s obvious that Pixar put a lot of effort in redefining what 3D movies are meant to evoke in an audience. Instead of cheap gimmicky “pop out” moments, the entire film is in complete 3D at all times, creating the effect of looking “into” a window and watching the events unfold, instead of seeing things come “out.” Of course, there are still exciting moments that utilize the technology to great effect, such as a chase sequence where bees and rocks fly out past your head. Also, the 3D was used to emphasize the emotional baseline of the film. When Carl is alone in his house, constricted and solitary, the film is quite flat. However, when the house busts free of its foundation and the multicolored balloons erupt into the sky, the film suddenly draws much more depth to create a sense of freedom and giddiness. Overall, I loved the film and that opinion is clearly shared by the Cannes audience, which included actresses Aishwarya Rai, Tilda Swinton, and Penn alum Elizabeth Banks (C'96)." Check back tomorrow as Brian talks about more of the must sees and the must skips! I participated in last year’s Penn-in-Cannes program, run by the fantastic Nicola Gentili and Meta Mazaj. During my time here, I walked 18 red carpet premieres and watched around 25 films, with only a Cinephile badge, the lowest of the colored badge hierarchy. I accumulated much knowledge about the festival and its inner workings, making many brilliant international contacts along the way. This year, I’m back with a film in the Short Film Corner (a subsection of the Festival) and the Marche du Film (the Film Market, the other half of the Festival that goes unnoticed by civilian eyes). With my new Festival badge, I have official access into the Palais, which was a forbidden grand fortress last year, and I hope to uncover more information and details about the Festival from the inside. I’ll be sharing everything I learn and hopefully illuminate the machinery behind the world’s largest and most glamorous film festival. Last year’s correspondent, Felisha Liu (W'09), revealed the tricky games we had to play to gain access to the much sought after red carpet gala screenings. These screenings all took place in the Grand Theatre Lumiere, right in the heart of the Palais de Festivals. There are normally two gala screenings a night, one around 7pm and another around 10:30pm, with the occasional midnight screenings reserved for genre films such as Sam Raimi’s Drag Me To Hell. We had to hold up signs and beg for sparkly invitations that would get us into these screenings, wearing our tuxedos and evening gowns, hoping a kind soul would come by and unload any extra tickets on us." Click HERE to find out what Brian's new accreditation allowed him to do, what degree of "begging" he had to do this year ...and with which big celebrity he had a close encounter! "This year, my new accreditation allows me to sign up for these invitations online, so I can avoid the begging as much as possible. Each badge holder is given a certain number of initial points, as well as a maximum amount of points that person is allowed to accumulate. He or she is also told how quickly his or her points refresh. The website then lists all the screenings available for that person. Nothing was more satisfying than entering the Palais and picking up my invitation for Jane Campion’s newest film, “Bright Star”, free of the hassle of begging. However, there are drawbacks. People with higher-level accreditation are allowed more screenings to choose from and at earlier times. For example, one of the most coveted screenings this festival is next Wednesday’s premiere of Quentin Tarantino’s “Inglorious Basterds” starring Brad Pitt. For a low level badge like mine, that screening is already sold out. When this happens, I have to go back to begging like last year to get into some of the best screenings. Speaking of Brad Pitt, I was window-shopping down the Croisette, the main boulevard in Cannes, and I noticed a small crowd of people outside of an upscale store. This reminded me of a similar scene last year, when a crowd mobbed the Gucci store because Sean Combs was shopping inside. I peered inside the window and couldn’t see anybody for about thirty seconds, before Brad Pitt walks right in front of me. He was checking out a very cool leather jacket. Suffice it to say, the next day, I went back to that store and found that very same jacket. Too bad it didn’t fit me. Check back tomorrow to find out about the first film to open in Cannes and Brian's take on it! 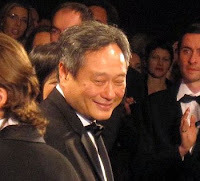 We've Got Penn in Cannes Exclusive Film Festival Coverage All This Week! 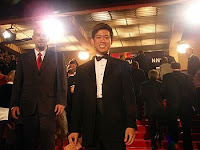 Last year we had our special Penn in Cannes correspondent Felisha Liu (W'09) providing us with coverage from the festival. Brian will be a Senior in the Wharton School this fall, studying Marketing and an individualized concentration in Media and Entertainment. He also attended the Cannes Film Festival last year as part of the Penn-in-Cannes program, but this year he's back with a film in the Short Film Corner and Film Market (he was a Producer and Director of Photography for a short film directed by Courtney Terwilliger (C'10) called The Power of Freedom). 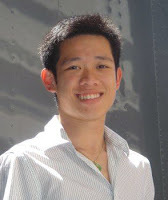 Brian also writes film critique for 34th Street Magazine and is Business Manager for Penn Singers. the much better access he had with his higher "festival badge accreditation"